I previously wrote a post on getting an early start to the day. And in that time, I've also realized that there are only so much that I can do in that time. One thing that I do want to emphasize is that you want to manage it in such a way that you don't get exhausted by the time you get to work or school. Before I get into some of the popular ones that I have come across over the years, there are a couple of things I want to get across. First, whatever you do, just start doing it. Get up early. Yeah, tomorrow. Start. That's the key to everything. In fact, isn't that the key to it all? Second, why are you doing this? Getting up in the morning is great. I mean it but I think it is important to find a purpose for what you're doing. That can come later. But what I mean is how getting up early in the morning fits into your overall day. At some point, just think about it. It can make your morning more effective. And going back to the first point: start. The most popular morning ritual I see is the meditation. I'll be honest. I don't know if it is for everyone but I think it is worth a shot. But let me start this is: going to bed at a good time and waking up early. People seem to believe that waking up early is the first step. It is actually the night before - what time you went to bed. Everyone have different needs in terms of hours of sleep. Eight is optimal but I think it varies a hour or two - as in 6-8 hours. Personally, I like to sleep more but five seems to be all I get, and six some days. My bed time is around 11 and I wake up around 4 am. I've gone to sleep earlier around 9:30 when I fall sleep in front of the TV (bad habit, guys) and end up wide awake around 2:30 or 3 am (perhaps we can explore the bad habits of unsuccessful people at a future date - bad habits that I have plenty of). Now, if you want to go back a bit further, we can discuss diet and what to eat for dinner. Like all the things mentioned above, it varies from person to person. Okay, now that you're awake, what now? I like stretching a bit and do some walking around the room or house. This is usually about 10 minutes but it varies. Honestly, I change my routine so much that, honestly, waking up early truly the only thing that is routine about my morning. Oh, and yeah, the temperature kind of matter to me. So some light body movement to warn up the body helps a lot. While I do that, I make a cup of coffee. And weather permitting, I like to step outside and have my coffee and just take in the morning. I might bring a book or my phone just to catch up on some tweets, articles, or look through my messsages/emails. Some people do that. Some don't. What you don't want to do is to have your phone or tablet close next to your bed so that it becomes easy for you to pick it up and lie in bed reading or playing a quick game. That can stretch into half an hour or more. Some people would suggest that leaving the phone behind is important so you don't get distracted. Perhaps there is some wisdom in that but going through the schedule and mail lets me know how my day is shaping up and what I'm up against. Some take up writing. Boy, would I like to do that. Personally, I do not always have something to jot down. When I do write, I found myself writing about the morning and what I hope to accomplish that particular day or focus on some worry or issue that I might have. I do think a lot so perhaps, I can start with that. A to-do list is what I have read and heard people do as a part of their morning writings. I do caution this: do not end up overwhelming yourself (I like to share with you another time what I do in addition to a to-do list). I have a list and I pick two or three things I want to get done that particular day. And if it all goes well, I do another. And I stop there. One habit I did pick up is that I write throughout the day even when I'm at the office. I generally like to work out after work as with most people. But I find that if I can get in a good 20-30 minutes of heart pumping cardio, it really gets me amped up for the day. Sometimes, no so heart pumping but anything helps. And after that, a quick shower is like a second awakening to the morning. I find a lot of people work out in the morning. Sure, we read about it but to see the number of people out running in the morning or at the gym is impressive. I'm sure we are a minority but we are who we are. And I like to get out there. There are a couple of things that I would like to incorporate into my routine. Perhaps squeeze in another 15 to 20 minutes of learning. I have been learning to draw. Perhaps that is what I can do more of in addition to writing more. There is one side-effect to my morning routine. And it's a good one. A lot of what I do in the morning I realized I did when I get to the office. And since I've done a lot of it already (like reading the day's headlines and sorted through messages and emails), I can dive right into my work. I'm energized even when I know I'm about to face a tough or long day - knowing that I've done something already and I'm on my way to checking off a couple more items on my list. Of course, there are days when I slack off. I just want to stay in bed. I feel off for some reason. I'm human. And that's perfectly fine. We are not automatons. And life sometimes just throws us off. Just know that there is always another morning tomorrow. Comic Book Futures Are Always So Bleak: What If It Was? Spoilers regarding The Flash on WB. You've been warned. X-Men. Batman. And now, the Flash on WB. In season 3, the Flash goes into the future to find out who Savitar is so he can take that information back to 2017 and use that to defeat the god of speed. 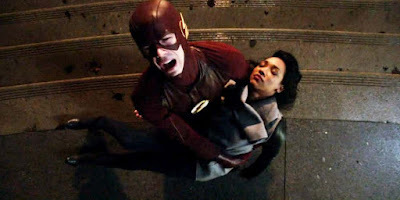 Once he got there, he saw just how the dead of his love and wife, Iris West Allen, affected his future self and Team Flash. If you keep up with the comic books, it always seem like the future is bleak for our hero's and humanity in general. Apocalypse. Dystopia. Earth somehow with less warmth while the environment is totally destroyed by our own foolishness and wars. The protectors were all broken and some still fight but don't really see the point other than to fight because that is all that they have left. What if the future did not have to turn out this way? I'm still working through the Flash series but what if the future is made more bright somehow by a sacrifice or a tragedy visited upon our hero and the team. Books with a dystopian future makes stories more compelling and gives the readers something to hope for, that by the end of the book, things will be set right. It is the struggle against the greatest odds anyone can possibly face that readers flock to and hope to see a little bit of the hero in themselves. What if Barry Allen's loss somehow secured a better future? I think that would made a more compelling story that is more true to what life is like today. People die all the time and, yet, some of us continue to live and remain hopeful through our actions to live and try to do better. Try to be better. And that and other acts help to build a bright future. If the Barry Allen took the greatest loss in his life and he and his friends doubled down on trying to fight crime and ended up building a better future than if Iris had not died. Of course, knowing this, it would be interesting to explore whether Barry Allen would allow time to take its course and have it cut short his time with his wife. Save his wife and maybe end up with a bleak future or allow his wife to die but that would mean a better future for humanity? It would be interesting to see a battle inside Team Flash deciding how Team Flash deals with the tragedy and rebuilds itself. Note: The Flash isn't real and it is a television show. So, in the end, Barry Allen and the audience gets to end up with just about everything they want: Iris lives and a future to look forward to. There is no need for a spoiler warning, right? I wake up at an early hour. I've been like that as a child. As far back as I can remember because my brother and I used to wake up at six to watch morning cartoons on week and that sort of stuck for weekdays as well, regardless of whether it's carefree summer or school days. It's one thing that I'm rather proud of. Even now, as my family sleeps, I would enjoy my first cup of coffee. I'm on the tablet most of the time catching up on the day's news. On weekend, the Los Angeles Times Sunday edition. I have been reading a few articles on what people should do in the morning and try to accomplish before work or school. I try to do a quick work out, write a bit, read something besides sports news or indulge in social media, and plan for the day. There are plenty of articles out there like that. And while it is a no-brainer that getting a head start is always good, will doing all this and more really turn us into the successful people we read about who also happen to have practiced these morning rituals? The answer I heard that just came into your head is "no". There are obviously other factors that are involved. It takes patience and time. It also factors in things like what your goals are and how hard you're really willing to work to get there. One thing I've like to incorporate into my morning rituals from one of the articles I've read about is to do at least one thing that further my long-term goals. I have been trying to learn to draw and program. I doodle here and there and when I can, write a few lines of apps that solve a math problem at work. I think I should do more than that. And do that as part of my morning ritual. Meditation is something a few suggested it. It's not for me but I'm not putting this in the "no" column. I've tried mediation before and, honestly, I have not given it a chance. I'm not sure it is for me but perhaps when I am more organized with my ritual and life, I should revisit this. There are another set of suggestions that relates to putting you in the right mood. I think if you're the type of individual who wakes up early and try to get started before the rest of the world, I think you're in the right mood. You don't need anything more uplifting or have the need to look at yourself in the mirror and say to yourself "I'm special. I'm awesome. I'm going to do great today". I don't know if you're awesome. Probably not special (nor am I). And you'll probably have a productive day if all goes well. One glaring omission is social media. I've read nowhere that suggests we spend a few minutes on Facebook, Instagram, or Twitter. I'm fine with Twitter since I use it as a source of news information pertinent to my work and generally staying informed - I stay away from Hollywood, gossips, and anything that I feel are a waste of data center storage space and that includes Facebook, Snapchat, and other social networks. How about you? What do you do to start the morning early?